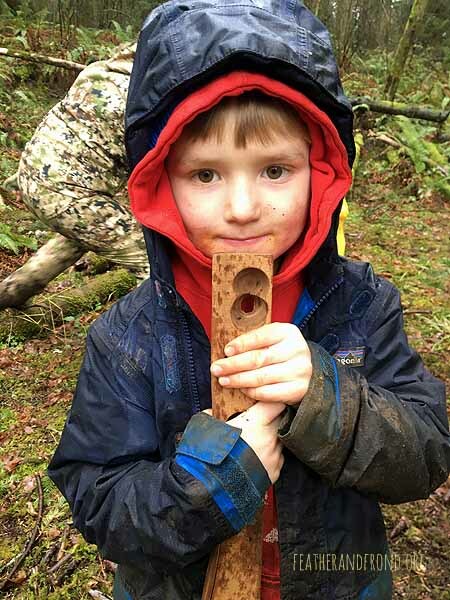 Our journey into exploring the art of bird language continued last week at Fox Walkers! Our puppet show portrayed a variety of species of birds using a very important bird voice known as alarm. Alarm is used by birds to indicate that there is some sort of disturbance in the forest (for an in-depth discussion on the varieties of bird alarms, read my blog post here). In this story, Running Deer was at her sit spot and observed several varieties of birds making a “parabolic” alarm shape at an owl. Later, Running Deer observed the birds making an “oppression/tunnel of silence” alarm at a cougar. Running Deer was grateful that the birds use their voices to spread an awareness of predators throughout the forest, for she may never have noticed the owl or the cougar had she not been paying attention bird language! 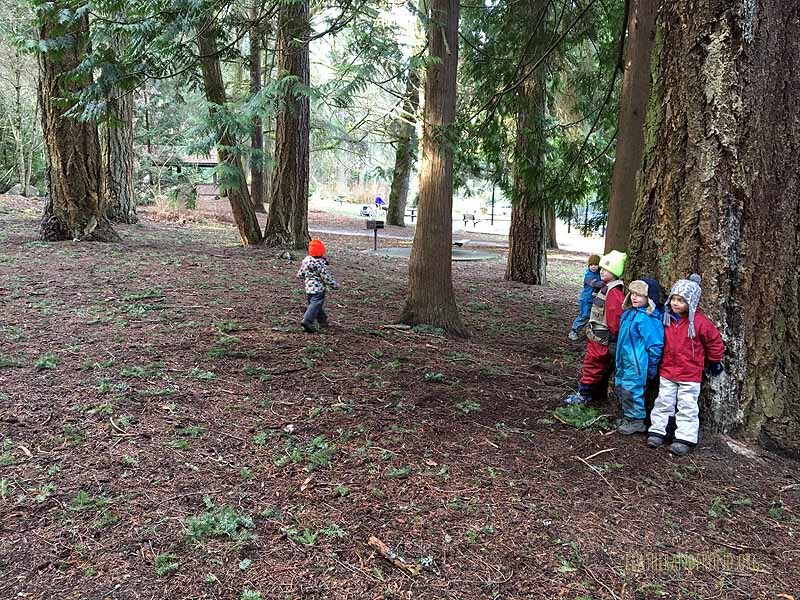 This story was particularly potent for our Fox Walkers crew at Fairhaven Park last week, as a recent report of a cougar sighting in the area inspired us all to pay VERY close attention to bird language! Although we didn’t see any cougars, nor did we notice their tracks or sign while we were out on our adventures, we did get to witness bird language in action as we heard songbird alarms ripple throughout the forest as a Cooper’s Hawk dive-bombed a Pileated Woodpecker! Some other highlights for the Fairhaven Fox Walkers were: finding opossum bones on the side of the trail, examining mysterious fur in the meadow, playing an epic game of Fire in the Forest in the soccer field, adventuring to “Falcon’s Nest”, and practicing our sneaking skills during a game of Fire Keeper. Some highlights for the Whatcom Falls Park Fox Walkers crew last week were: watching Patrick get a bow drill coal and blow his tinder bundle into a flame, exploring a variety of bird feathers from our Nature Museum, playing Jays and Chickadees as well as many child-led variations on bird language games, tending our “gardens” at Heart Home, visiting the duck pond and “fishing”/checking out the birds/playing games over there! Looking forward to another week of beautiful sunny-day adventures! Bird feathers at the Nature Museum! Pat got a Bow-drill coal and blew it into a flame! Playing Jays & Chickadees.. here comes the Cooper's Hawk! An accent piece for our shelter..
Tending the "garden" at Heart Home! Fun in the mud & sun! We love visits to the pond! Looking at tracks.. no cougars here! Did deer pass through here? 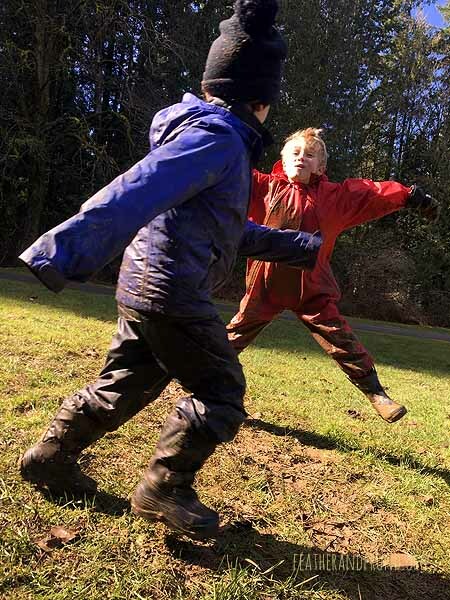 Mud play on a sunny day. . .
Pat and the Owl puppet! Foraging for late winter edibles. . . Indian Plum leaves are a favorite! A sneaky game of Fire Keeper! Trying to steal the "fire"
Someone munched an opossum for lunch! Whoops, drilled right through the fire board!